Iron On Labels for all children from Babies and Toddlers (choose our short size label) to School and Boarding School. Fast Service if needed. Choose Courier option. Or FREE STANDARD POST. One of the few firms to still offer free shipping if you have the time! Name labels for boarding school. Avoid the 2018 rush. Order NOW. See Value Packs. We supply the leading boarding schools with iron on labels that really stay on for a boarding school wash. VALUE PACKS have iron on labels, shoe labels and stickers for personal items. It's that time of year again! Get organised for 2019 with NAME IT. Label all your kids clothing and items for school. Quality clothing name labels for Rest Homes. Many people need this quickly. We offer an overnight courier service around New Zealand. Our iron on are specifically made for commercial wash, but we also have soft satin-feel for hand sewers. We include FREE shipping with NZ post (5 - 7 days) or please upgrade to our COURIER option with tracking (1 - 2 days) for $5 at check out. Established in 1992, we are New Zealand owned and all orders are printed in New Zealand which is why we can offer such quick service. OR our soft satin-feel sew-on for hand sewers or machine sewers. Our Shoe Labels stick inside the shoe with a unique, clear, long lasting, protective cover. Don't hesitate to contact us Via our ON LINE CHAT. Write any special requests in the COMMENT section available on every order. See our genuine 100% positive feedback on our TradeMe.co.nz store. Our TradeMe user name is ".nameit." click here to view our profile. 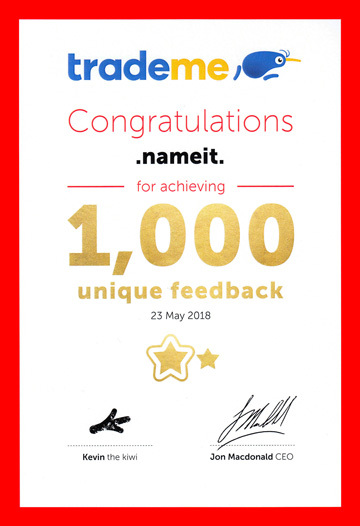 Our official TradeMe certificate for achieving 1000 unique positive reviews.